Tasteful, ornate and luxurious; the Monterey Teak Outdoor Furniture Collection is ideal for seaside living or for a little classic glamour in your own backyard. Whether your space is large or small, inside or outside; the Monterey Teak Outdoor Furniture Collection has a piece for every area. Completing the Collection are 6 great pieces: Monterey 3 Seater, 2 Seater, Club Chair, Ottoman, Coffee Table and Side Table. 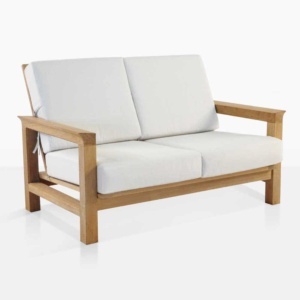 A relaxed back, angled arms, and sturdy wood frame helps define the tranquil look of the set. The wide angular arms create a wonderful, welcoming place to rest and contrast beautifully with the plush Sunbrella® cushions. Placing the Monterey three-seater Sofa in the centre of your space, with a two-seater Loveseat on either side and a couple of Monterey Club Chairs dotted around the area, complemented by the fabulous Monterey Side Tables for more intimate discussions, will create an overall look that is perfect for large gatherings. 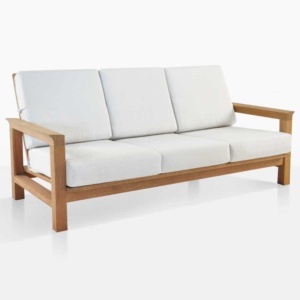 The Monterey Teak Outdoor Furniture Collection features our signature, highly sought after Grade A Teak wood; held together with marine grade bolts and glues, and cushioned with chic Sunbrella®; superb for outdoors and available now in a range of elegant, classic colours: Canvas and Taupe. 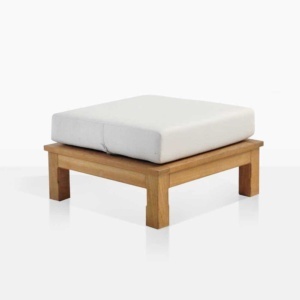 The cushions feature Quick dry foam inside. 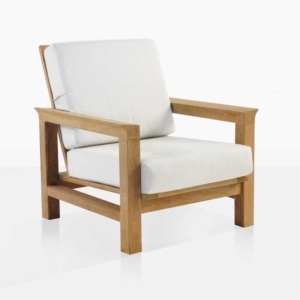 Sunbrella® cushions, as shown, come FREE with your Monterey Teak Outdoor Furniture seating pieces!